Those of you who have stopped at the service station in Gloucester will know that it isn’t an ordinary motorway services. It is on the M5, but the minute you drive up to it, with its grass roof, you know it is something different. The services are lovely, with a large country kitchen style cafe that over looks geese in pond with a waterfall, and a farm shop selling heaps of fab foodie goodies. If only all services were like this. We managed to fill a basket of interesting items and these chocolates were just one of our many Foodstuff Finds. 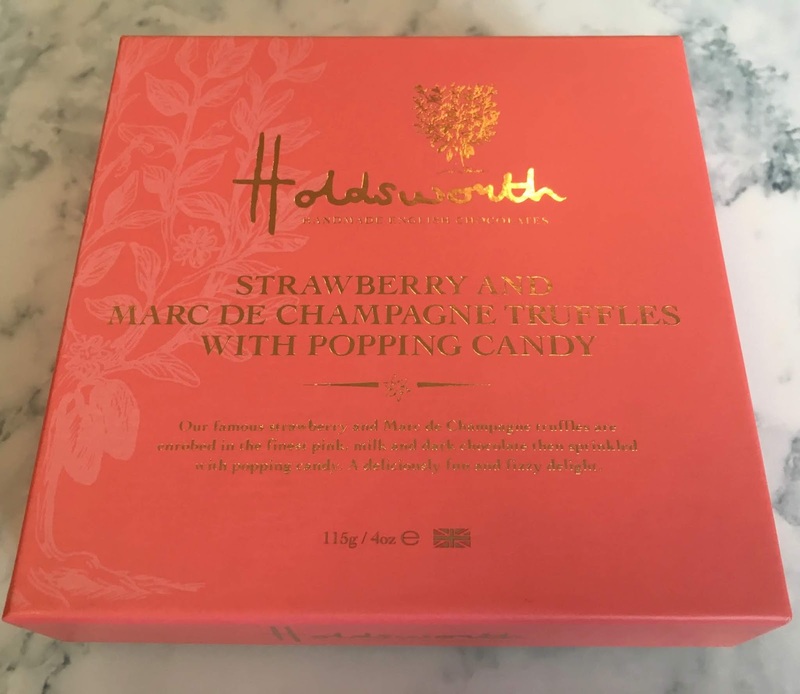 The chocolates are from Holdsworth and are flavoured with Strawberry and Marc De Champagne, and topped with gold coloured popping candy. 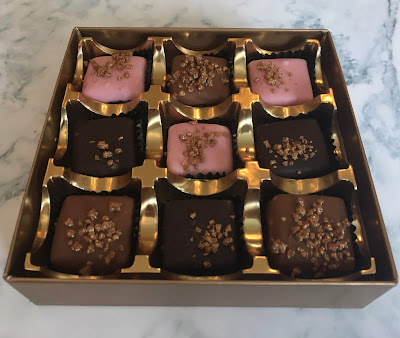 There are nine chocolates inside the box, three dark, three milk and three (pink coloured) white chocolates. These are not made with pink cocoa. They look very pretty and I gave them a try. The chocolate filling has a fab flavour, predominantly sweet strawberry, with just a gentle hit of Marc De Champagne. The chocolate goes with them perfectly, and varies from an intense flavour with the dark chocolates too a sweet delight with the pink ones. The popping candy is very mild, and can be a bit lost unless you look for it, but it was a nice addition, I think it just needed a bit more. These chocolates are so wonderfully fruity, and are proper grown up strawberry creams. They are the perfect summer gift chocolates or indeed a bit of treat, perfect to nibble while watching Wimbledon on the TV. The do feel very quintessentially British.